Moonshiner's Daughter is the early life story of a young girl raised in the some of the most remote, backwoods parts of Haywood County, North Carolina, deep in the heart of the Great Smoky Mountains. Her father, an ardent moonshiner when he wasn't in prison, and her mother, often showing mental illness from an earlier brain injury, raised their four children in some of the grimmest circumstances that you will ever read about. Mary Judith Messer eventually escaped her extreme living conditions by going to live with a family as their mother's helper near Washington, DC. She then moved to New York City to live with her older sister who had run away from a forced marriage. 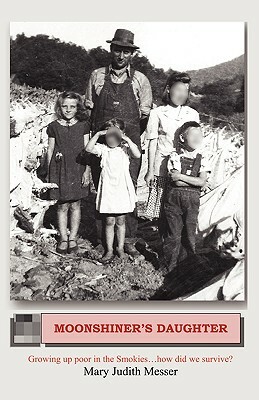 The memoir Moonshiner's Daughter is told through the eyes and words of a barely educated child and teenager yet their meaning and descriptions are clear as a mountain stream. She changed the names of most people and places to protect her still living family members. Authors Robert Morgan & Ron Rash give recommendations.